Hellooooo Beaders! Leah here from Eureka Crystal Beads!! I’m super excited (can you tell?) to show you a technique I love: Free-Form Peyote! The compilation image I’ve included here is comprised of some lovely examples I found when I did a Google Image search. Check out Google or Pinterest to find some amazing eye-candy inspiration!! I’ve heard from many-a-beader that they are simply overwhelmed at the idea of free-form ANYTHING (free-form peyote, free-form brick stitch, etc.) because it’s not a pattern that you follow like many other projects or basic versions of various bead stitches. It’s so easy to scroll through Pinterest and see amazingly stunning (and daunting!) examples of free-form bead stitches and it’s easy to feel discouraged from the very start. First, you should know that Free-Form Peyote is a great way to utilize small amount of beads you have left that you love. This is because – anything goes!! It’s free-form! 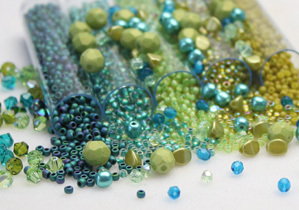 So, rather than concentrate on what types of beads you’re going to need, focus first on what COLORS you love. Select a variety of beads in colors and combinations that simply tickle your fancy. Try your best to incorporate different sizes and TEXTURES to truly get a stunning effect in your project, but at the end of the day, there are no real rules when it comes to a project like this. I try to incorporate beads like the following: Miyuki Delicas, Toho size 11/o’s, Toho size 8/o’s, (even Toho size 6/o’s to add some real volume if you like! ), along with some real small beads like Toho size 15/o’s! I also like to use small Czech 3mm firepolish as well! Keep in mind, you can let your free-form beadwork be the star OR you can use it as a canvas to add some surface embellishments like stones, shells, pearls, Czech leaves and flowers…you’re only limited by your imagination! If you’re having some trouble picking out beads, make sure to check out our Coordinated Beads Mixes and you’ll be sure to find some GREAT options there!! In the following images, you’ll see how I’ve laid out the beads I’ve selected to work with! This is just an example of what I’m doing, what you choose can be drastically different and still be amazing!! I’ve also chosen to work my Peyote vertically, so it will go back and forth over the entire length of the bracelet. Pictured are: 3mm firepolish, 2 colors of a Toho size 11/o, 2 colors of a Miyuki Delica, 1 color of an 8/o, 1 color of a 6/o, 1 color of a 15/o, and a fun rectangular Czech glass bead that I’ll use once I’m further along in my bracelet. Next, you’ll see that I’ve loaded on a length of beads – I’ve used a little of everything and loaded them on in random chunks and in random amounts. The only thing I want to make sure of is that it’s an even amount just to make my Peyote a little easier since I won’t have to deal with the awkward turn-around of odd-count Peyote. I use my needle to move the beads over 2 at a time to check that I have an even number. If I’m left with 1 bead at the end then I know I have to take off that bead or add one more. Lastly, I take my tail thread and loop back through the closest bead so create a Stop Bead so my beads won’t come off the end of my 6lb FireLine Beading Thread. In the below images, you’ll see how I’ve started my basic Peyote stitch. (If you need a refresher on basic Peyote stitch, make sure to check out my video on it!) For this row, I’m going to keep things simple and pick up the same beads for that area – for the most part. Essentially, whatever bead my thread is coming out of at each step, that will be the bead I pick up next. There are some instances, you’ll see, where I’ve picked up 2 beads to sit on top of a much much larger bead if that’s how the Peyote worked out. Remember, these aren’t hard and fast rules – simply guidelines for what I’ve done, feel free to make your own choices! 🙂 I’ve also started to blend color areas together. For example, if I was doing Peyote in an area that had blues/greens, I started to add some purples and pinks! UPDATE: Here is PART 2 of Free Form Peyote on the Eureka Crystal Beads YouTube channel!! Previous Post Our Coordinated Mixes Make an EASY and STUNNING Memory Wire Bracelet! Next Post Why I Love SUPERDUOS!! Is there a way this can be printed? I would love to try this technique. Hi, can you tell me what kind of thread you use? The bracelet looks beautiful and I like the fact that I don’t need to follow the instruction but I can decide how I would like to bracelet to be while making it. Hi Noriko! I used 6 lb. FireLine 🙂 I’ve linked you below to the 6 lb. in “smoke” and the 6 lb. in “crystal” – depending on if you’re looking to use mostly dark or mostly light beads. Glad you liked the post! !